Look at my awesome desk! I got the top organized and cleared out most of the drawers. It makes such a nice place to work when I need a computer to sit down to. It's so nice to look at this picture. I hope my mom sees it and makes a comment about what a good job I did. Yes, I'm 36 years old and still looking for affirmations from my mom! By the way, mom, if you're reading, you can stop now. Just give me a call on the phone and tell me you love my desk! Is she gone?? Good, cause after I took that picture up there, I backed up a bit and took another one. I really did work hard to get the desk cleaned up. 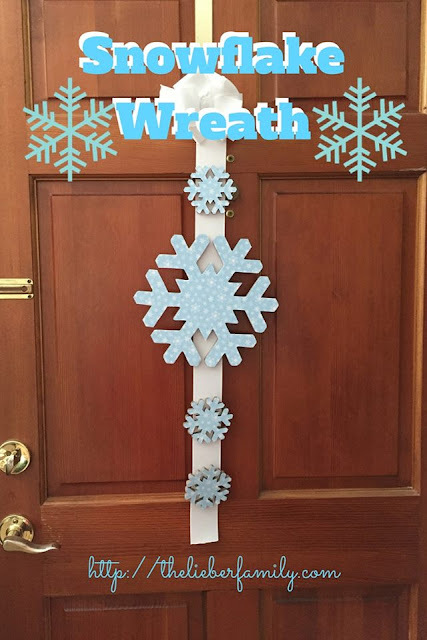 Then I rooted through my sewing materials a few times over Christmas. And there on the left you can see my storage bins for the kids' school work. I really do use them! I even have a basket on top so we can put stuff there if we can't file it right away. Well, we used to have a basket there...Henry was trying to put something in the basket and he knocked it over completely. Of course, he didn't clean up any of that mess. My book shelf is in serious need of an intervention and I am totally ready to do that...as soon as I can get to the shelf! To the right of the desk is where I had put my bar stool from my teaching days. Ken decided he wanted it in the kitchen, so he took the stuff off of it, added it to the mess already there and then moved the stool. When I picked my word of the year this is the exact thing I had in mind. And I promise, I will get to it! I've been getting rid of little pockets of stuff all over the house this month. I'm trying to take pictures so I can prove it in a post later. For the sake of full disclosure, they'll probably be very closely cropped pictures. I'm not embarrassed to post either of these pictures, but I'd rather post the clean looking ones. They motivate me better even if they aren't showing the whole picture. What do you think of the practice of posting closely cropped pictures? Is it lying or just selective truth-telling? 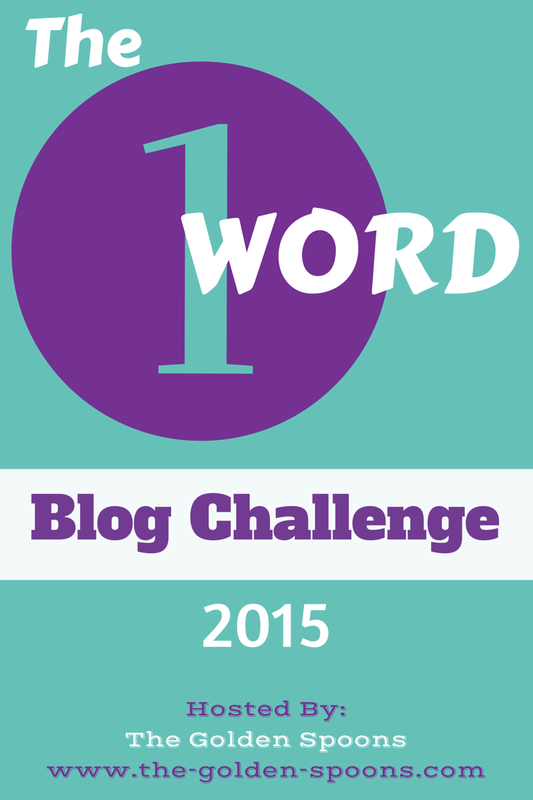 I'm linking up today with Lisa's 1-Word Challenge (I used two of them this time). I'm also linking up with Jen for the Mommy Reality Challenge: The Gritty Reboot. Love this! It's so hard to get a whole room looking good for any length of time. Especially if the other members of the family are conspiring against you! :) I hope your mom called and told you your desk looks great! We have tons of clutter too, it makes me crazy. 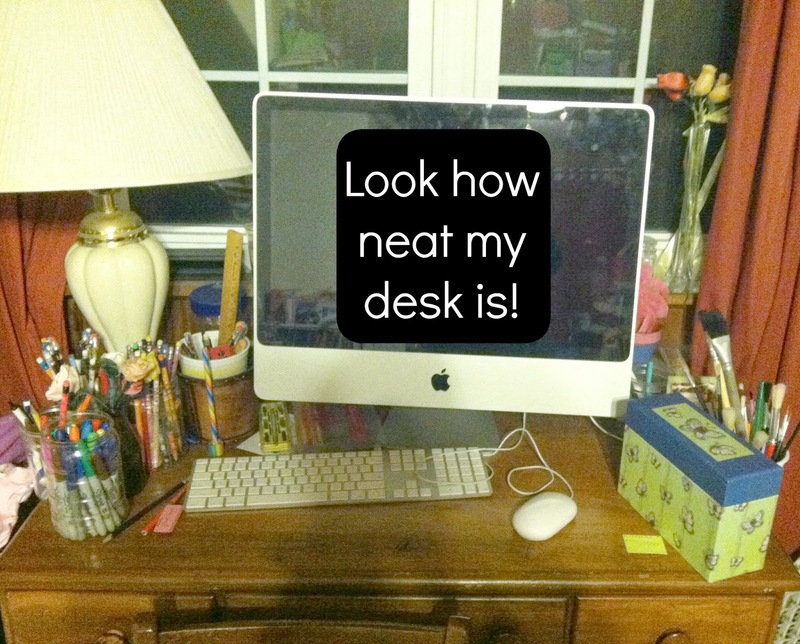 However, my desk is the one area that I always keep clutter free! It is the only space in my whole house that is MINE! You can do it! Baby steps friend! This is hilarious. Really - I laughed out loud. I love you, Rabia, but your office would give me hives. I am a neat freak! I'm not the best cleaner, but I am an excellent de-clutterer. Please take pics of your progress - you deserve the praise when you work hard! I struggle with this all the time too! Especially on recipes. I have some part of counter space that is clean for photos, but the mess I made creating the recipe is spread everywhere else lol. Hahahahaha! This is so me! Shove everything out of the way while I'm taking a picture! Bwahaha!! This is fabulous! Did your Mom call? 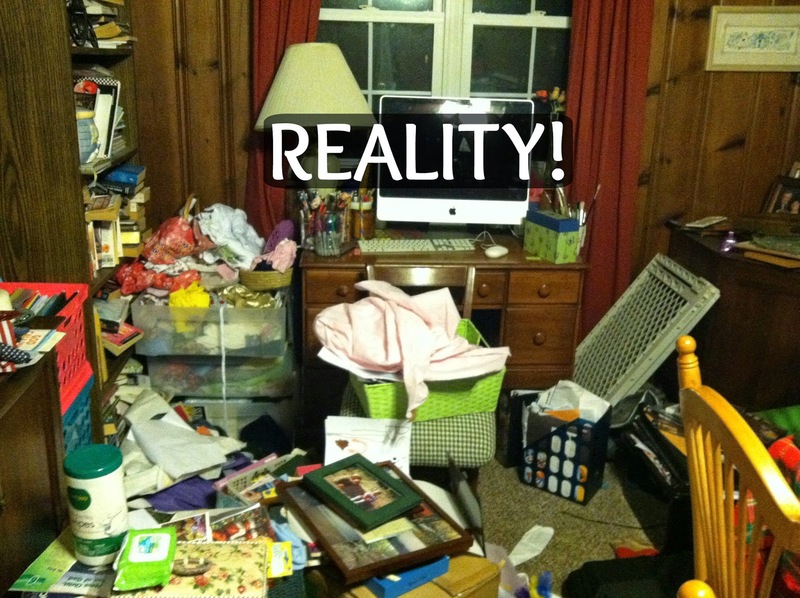 This is really, real life and your pictures looks awfully familiar. I think we could swap desk pictures and no one would know which is which! Thanks for linking up! Baby steps. I'm working on it very slowly!! Ha! I love this! So awesome and this is reality and it's totally okay. I usually don't post my messes... usually. Thanks for being so candid! Hehe I could totally identify with this! Good on you for sharing your messes! I did the same when I did the 20 day Challenge with The Organised Housewife. Seeing my after photos (product) made it all worth it and you will too! GO YOU! We are all here to support you! :) De-cluttering is good for the mind, body & soul! You can do this! Love that you're showing us the real side of what life is like for many of us! I'm impressed you had the guts to capture reality and to be vulnerable in a world that views perfect, organized, and clean houses as the norm instead of seeing and valuing what's real (like people in the media are perceived too). ha! I love those pullback photos where you can see the whole thing. If you did that even with professional photography, it's similar! We like to make things look good! Actually she said she was shocked that I would post such a picture. I explained my reasoning, and I think she got it. She thinks people will think she didn't teach me any better, but I take full responsibility for it! I don't actually use that desk very often because I prefer my iPad for most things. However, I would love that whole room to look much cleaner. It is a multi-purpose room and it has way too much stuff in it! I hope that people see the fantasy vs the reality and feel better when their homes don't look Pinterest-y enough. Thanks Jennifer. I don't *like* posting my messes, but sometimes it's important in order to keep it real. Thanks for stopping by! Just wait! The messes get bigger as the kids get bigger! LOL! I'm excited to get it taken care of and to post the results. Thanks for your support! Thanks for the vote of confidence, Kim! I can do it!! The zoom function is such a sanity saver, isn't it!! Thanks Nicole, that's one of the reasons my blog is public. I think it keeps me honest and real. If I tried to fake it, someone would call me out in a heartbeat! It's human nature to want to make things look good. We all do it. I just think that every once in a while we have to step back and make sure we make things look real too. Glad you enjoyed it! I'm just keepin' it real! I have a tendency to post those close ups too.... pretty close to the same reason. With kids running around the house is never clean just a different daily version of messy. Well...she was a little embarrassed for me when she saw it, but I think we're good now. Our messy tends to stay messy for a while. We aren't in the house much except for evenings and weekends, but somehow things still accumulate! LOL! Blurry backgrounds, tight frames, and cropping! A messy person's best friends! LOL! Wow! I am impressed you have a clean desk. I think hell will freeze over before my desk gets clean! It's clean mostly because I don't use it that often!! LOL!! I actually used my desk a bit over the weekend and it was nice to be able to get to it. I first learned the art of cropping when I did it manually when I was an avid scrapbooker. I think it is one of THE best skills out there. Digitally or otherwise. ;) Good luck with your cleaning out! Wow, the first photo really had me fooled. Great example. I love the messy photo. I have one spot in my house that looks like that too. I've done pretty well so far, but I haven't taken all of the "after" photos yet. It is definitely a work in progress!! Thankfully mines not that bad anymore...for now! I know it'll happen again at some point.